The good news is that there are many products like Best Naturals Caralluma Fimbriata that can supplement your diet to promote weight loss. You just need to find one that utilizes the right components that works best for you. The manufacturer recommends taking two capsules one or more times per day, 30 minutes before meals with water or as recommended by a physician. The manufacturer warns that pregnant or lactating women, diabetics, hypoglycemic and people with known medical conditions and/or taking drugs should consult a licensed physician and/or pharmacist prior to taking this product. Internet pricing may vary from website to website. At the time of writing this review the product was found at a price of $19.19 for a bottle of 60 capsules, which under the suggested use would last about one month at the very most. The manufacturer provides a 30-day money back guarantee minus the shipping charges. 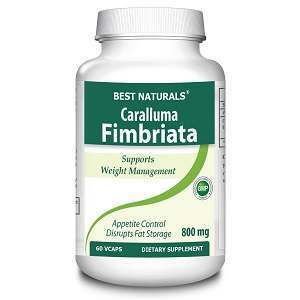 There are a lot of great weight loss products on the market, including Best Naturals Caralluma Fimbriata. However, because the price of this supplement is so cheap, we have questions about the efficiency of the supplement. As a result, we suggest that you keep looking for a more suitable product for your weight loss needs. Will Herboy	reviewed Best Naturals	on December 15th	 and gave it a rating of 2.